Early trains on the railway. 1833. The Hibernia and Vauxhall engines. 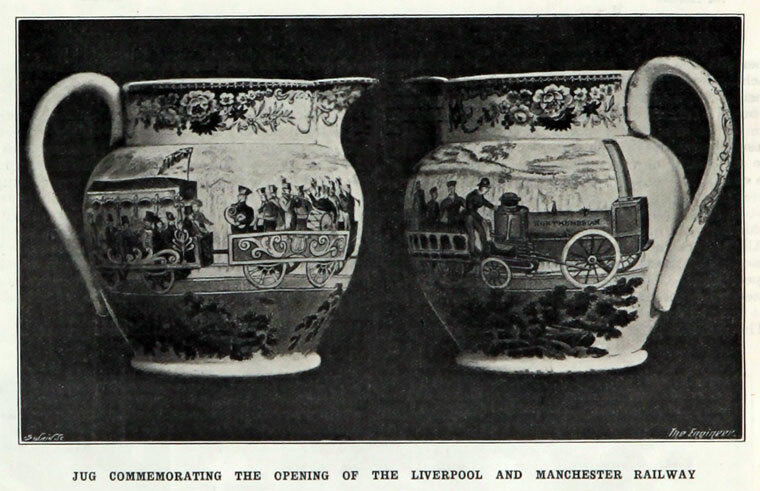 Jug commemorating the opening of the Liverpool and Manchester Railway. 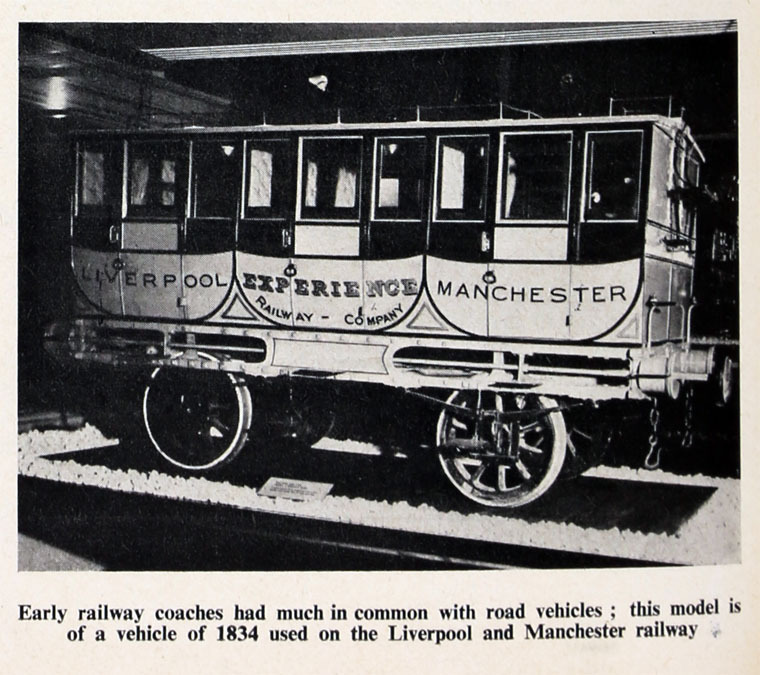 The Liverpool and Manchester Railway (L&MR) was the world's first intercity passenger railway in which all the trains were timetabled and operated for most of the distance solely by steam locomotives. The LMR was primarily built to provide faster transport of raw materials and finished goods between the port of Liverpool and mills in Manchester in north-west England. The initiative to build the Liverpool and Manchester Railway came from Joseph Sandars and William James and subsequently, a group of Lancashire businessmen, led by Charles Lawrence, Lister Ellis, Robert Gladstone, John Moss and Joseph Sandars asked George Stephenson to build them a railway between Liverpool and Manchester. The first means to give better communication other than by road, between Liverpool and Manchester, was the improvement of the river Mersey, then navigable from Liverpool to Runcorn so that boats could sail eastwards as far as Warrington. This work was sanctioned in 1694. By the Mersey and Irwell Navigation Act of 1720, the Irwell also was improved so that it was available westwards to Warrington. There was, thus, through waster communication between Liverpool and Manchester. The route taken was, however, so circuitous that boats followed a course of from 30 to 40 miles to cover a distance of no more than 20 to 25 miles. Moreover, there was rarely a sufficient depth of water in the summer, whilst in the winter the floods prevented navigation. 1755 Sankey Brook was canalised to improve navigation, but was unsuccessful due to flooding, and the crooked course taken by streams. These difficulties were however solved by the cutting of a new canal. The next step towards improving communication between Liverpool and Manchester was taken at the Manchester end in 1759. The then Duke of Bridgewater obtained powers to construct a canal from his collieries at Worsley to Manchester. The distance was only 7 miles, but the roads were impossible, and the Mersey and Irwell Navigation, would not reduce its charge of 3s. 6d. per ton, even though the Duke volunteered to provide his own boats. His canal was opened on July 17th, 1761 and in the following year he secured a Bill to make a canal from a junction with the Worsley Canal at Lingford Bridge, Manchester to Runcorn. 1824 20th May. 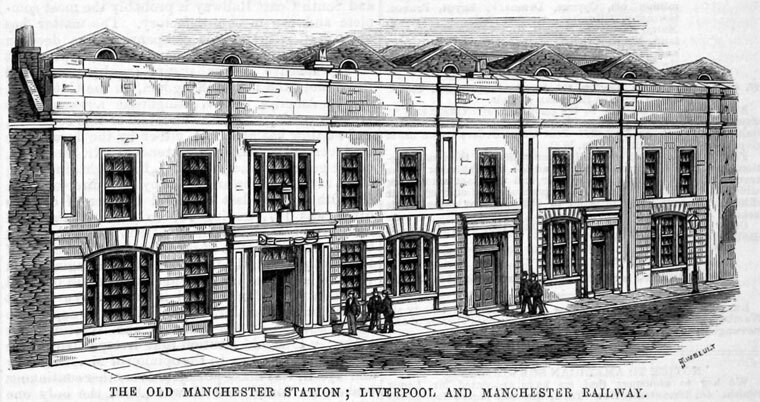 The Liverpool and Manchester Railway Company was founded. It was established by Henry Booth, who became its secretary and treasurer, along with other merchants from Liverpool and Manchester. The initial survey for the line was carried out by William James and Robert Stephenson and, being done surreptitiously and/or by trespass, was defective. Robert departed for South America and William James became bankrupt. In 1824 George Stephenson was appointed engineer in their place. By this time, he was taking on too much. As Robert was absent, George (who could not do the calculations required, and had relied on his son for this part of the business) left checking the survey to subordinates. 1825 In January, John Urpeth Rastrick was engaged by the promoters along with George Stephenson, Mr. Sylvester, Mr. Brunton, Philip Taylor, Mr. W. (now Sir W.) Cubitt, James Walker, Nicholas Wood and others, to visit the different collieries in the North of England, with a view of experimenting and reporting upon the tram-roads, and engines at work upon them. For this purpose a series of experiments was made with the locomotive engines on the colliery tramways at Killingworth and Hetton. 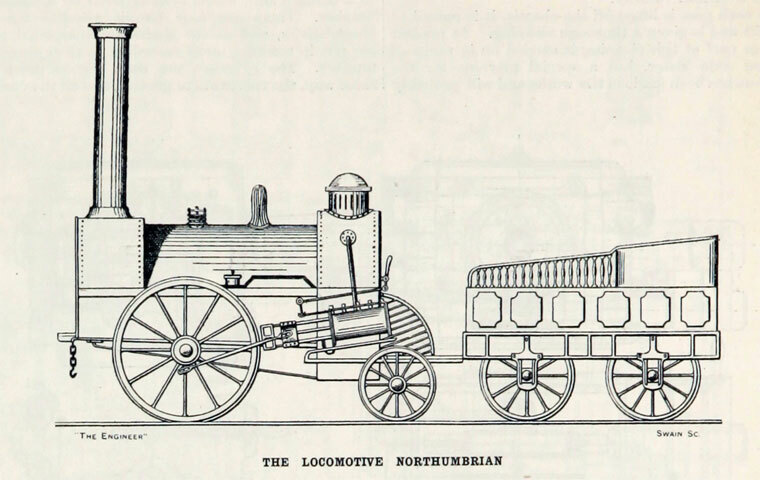 Their recommendation was that a combination of locomotive with stationary power should be used; but their Report was replied to so effectively by Robert Stephenson and Joseph Locke, that the celebrated Rainhill trials were instituted, and the locomotive system was fully established. 1826 May. The Bill was passed. In Liverpool 172 people took 1,979 shares, in London 96 took 844, Manchester 15 with 124, 24 others with 286. The Marquess of Stafford had 1,000, giving 308 shareholders with 4233 shares. Upon presentation to Parliament in 1825 it was shown to be inaccurate (particularly in relation to the Irwell bridge), and the first Bill was thrown out. A key opposition figure in this had been G. H. Bradshaw, one of the trustees of the Marquess of Stafford's Worsley estate, which included the Bridgewater Canal. In place of Stephenson, who was now in disgrace, the railway promoters appointed George Rennie and John Rennie as engineers, who chose Charles Vignoles as their surveyor. They also set out to placate the canal interests and had the good fortune to be able to approach the Marquess directly through the good offices of their counsel, Mr. Adam, who was a relative of one of the trustees, and the support of William Huskisson who knew the Marquess personally. Implacable opposition to the line changed to financial support, a considerable coup. 1829 The line was completed and the Rainhill Trials were run to find the best locomotive. The Rocket by George Stephenson was the winner. "The 24 vehicles thus left, behind were now formed into one continuous line, with the three remaining engines at their head and at 20 minute past 5 o'clock we set out on our return to Liverpool. The engines not having the power, however, to drag along the double load that had devolved upon them at a faster rate than 5 to 10 miles an hour -- once or twice only, and that but for a few minutes, did it reach the rate of 12 miles an hour -- it was past 8 o'clock before we reached Parkside, the scene of Mr. Huskisson 's melancholy accident. Here the engines again stopped for water and a good deal of time was wasted in the operation. Proceeding onwards we were met on the Kenyon embankment, by two of the missing engines which were immediately attached to the three which had drawn us from Manchester. It would be superfluous for us to inquire how it was that we happened to be deprived of the assistance of these engines since, instead of now accelerating out progress, they seemed actually to retard it. We went still slower than before, stopping continually to take water -- query, to take breath -- and creeping along at a snail's pace till we reached Sutton inclined plane, to get up which the greater part of the company were under the necessity of alighting and making use of their own legs. On reaching the top of the plane we once more took our seats and at 10 o'clock we found ourselves again at the company's station in Crown Street, having accomplished the distance of 33 miles in 4 hours and 40 minutes"
1840 They were running 11 trains a day in each direction with fares for a single journey ranging from 6s 6d to 4s 6d. Taken from The Newcomen Society Meeting of November 16th 1921, "The Liverpool and Manchester Railway" by C. F. Dendy Marshall. In 1797 William Jessop suggested that a tram-road to be worked by horses should be laid down between Liverpool and Manchester, and he surveyed a route. The following year Benjamin Outram made another survey for the line, but nothing came of either proposal. 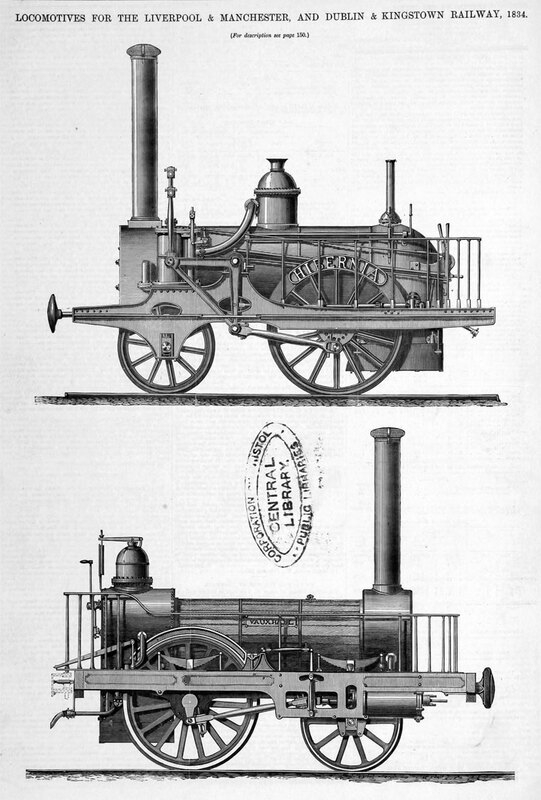 The credit for the earliest practical scheme is due to William James, who drew up a plan in 1821, based on a preliminary survey, for a “Line of Engine Railroad from Liverpool to Manchester,” in which he succeeded in Joseph Sandars, a Liverpool merchant, who became one of the most active promoters of the line. The first survey, in which Vignoles took part, was very imperfect, and a second one was made in 1822, with the assistance of Robert Stephenson. Soon afterward, owing to ill-health and financial embarrassments, James became incapable of proceeding further with the matter, and it was put in the hands of George Stephenson. The committee of 29th August 1824 consisted of: Charles Lawrence, John Moss, Robert Gladstone, Joseph Sanders, Lister Ellis, Thomas Shaw Brandreth, Robert Benson, H. H. Birley, Joseph Birley, Henry Booth, James Cropper, John Ewart, Peter Ewart, William Garnett, Richard Harrison, Thomas Hedlam, Isaac Hodgson, Adam Hodgson, Joseph Hornby, John Kennedy, Wellwood Maxwell, William Potter, William Rathbone, William Rotheram, John Ryle, Thomas Sharpe, John Wilson. We had the pleasure last week of laying before our readers a report of the proceedings at the general annual meeting of the proprietors of this great work, which was held at Liverpool on Thursday week. .....Mr. Stevenson's engine, the Rocket, which gained the prize of £500 during the late experiments at Rainhill some months past, has been constantly employed in coveying quantities the soft red rock found at Eccles, to Chat Moss, for the purpose of forming the surface of this road. This material is found so excellently adapted for that purpose, that the whole surface of the road at this end has been thickly laid with a super-stratum of it, after having been pounded into a fine sand. No other carriage, with the exception of the common waggons, has been employed in traversing this part of the railway; but when the work is visited by any of the directors, or when a pleasure party obtains permission to take a trip to the moss, a neat light carriage is employed for the purpose, and is drawn by horse power. Wooden mile-posts have been placed every quarter of a mile along the whole line, commencing at Liverpool and extending to Manchester. The last of these mile-posts yet erected is a little beyond Oldfield-lane, where the distance from Liverpool is stated to be 30 1/4 miles. The whole distance to Water-street will be about 30 3/4 miles. The figures appear in black paint upon a white ground. During the last summer the company purchased no less than eight millions of bricks, for the erection of their bridges, warehouses, wharfs, &c. Of these five millions were purchased from Mr. Jones, two millions from Mr. Brownbill, and one million from Mr. David Bellhouse, junior; and they were all made from clay excavated from the land lying between Cross-lane and Oldfield-lane, and principally from the excavations necessary for the level of the railway itself, which varies from fifteen to twenty feet below that of the field in question. The whole of this quantity and probably still further supply will be required for the erection of the different works and warehouses to be built at this end of the railway. Immediately on this side of the bridge now building, between Cross-lane and Oldfield-lane, the railway which runs all the way from Eccles in a perfectly straight line, and on a dead level takes a sweep or curve towards the north-east, and after passing Ordsall-lane, takes another sweep in contrary direction or towards the south-west. The object of this deviation from a right line is two-fold. In the first place, the valuable buildings in Trafalgar-place, and Well Meadow buildings is avoided ; and in the second place, the railway is thus brought nearly at right angles with the river, instead of crossing it in an oblique direction. 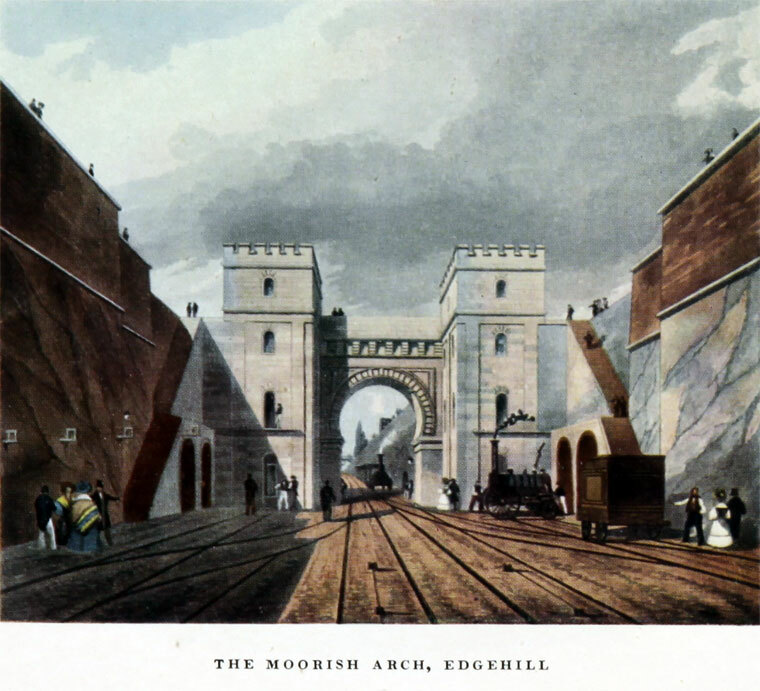 The bridge across the Irwell, however, will not be exactly at right angles with the direction of the stream, but will trend to the northwards to the extent of about twelve feet in each arch, or twenty-four feet on the whole length of the bridge. The bridge over the Irwell will consist of two arches. Its progress has been considerably impeded by unlooked for difficulties. After a good deal of interruption during the middle of the winter, partly from the long and severe frost, and partly from repeated inundations of the works, by floods in the river, the foundations of the piers on each side were at length laid, and the superstructure has since proceeded with all due rapidity and success. The piers on each side have been raised to nearly their full height, and the springers or first row of stones forming the arches have been laid. In laying the foundation of the centre pier, however, much greater difficulty has been experienced. A cofferdam was formed in the centre of the river, and the piles of which it was composed were driven, as was imagined, down to the solid rock, which forms the sub-stratum of the bed of the river. On the water pumped out, however, by means of a small steam-engine, of six horse power, which had been erected for the purpose on the bank of the river, it was discovered that the water flowed in copiously at the bottom of the piles, and on farther examination it was found that these had not penetrated to the rock, but were embedded in very thick stratum of gravel which lines the bed of the river. To remedy this defect a new set piles were driven to a proper depth outside of the former, all the interstices were carefully secured. This work has only been completed during the present week, and whenever the coffer-dam is thus rendered water-tight, the water will be pumped out, and the foundation the pier immediately laid. We understand that the workmen will then be employed night and day to hasten forward the work. The arches at first were intended have been built of brick, like the other bridges on the line, with a mere edging of stone work; and the contractor became bound, under heavy penalty, to have a bridge, upon this principle, completed by the 31st of May. The directors, however, afterwards determined that the arches should formed entirely of stone, and a fresh contract to that effect was entered into. We believe it is not now expected that the bridge will finished much sooner than the end of the present year. 32 Experiment 1833 Sharp, Roberts and Co. This page was last edited on 14 February 2018, at 11:18.